Bake Your Latkes This Hanukkah. You Won’t Regret it. Baked latkes for a healthier and less messy Hanukkah treat. Everyone loves potato latkes, but no one likes the mess of frying them or the guilt associated with eating them. 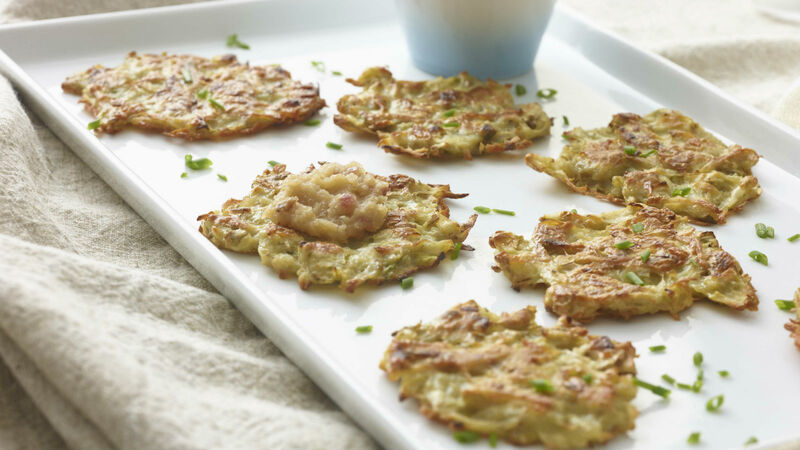 These latkes are baked in the oven and easily won over my kids. You do need to watch them so they don’t burn; they were done at different times in different ovens. And my pickled applesauce is basically a tangy-spicy applesauce, which we also eat like eating with schnitzel. You can watch Paula make these baked latkes in her own kitchen here. Note: Latkes may be made 2 days in advance and reheated in the oven or frozen; applesauce may be made 4 days in advance. You can also serve this with classic applesauce. Reprinted with permission from The Healthy Jewish Kitchen © 2017 by Paula Shoyer, Sterling Epicure. To make the latkes, preheat the oven to 450°F (230°C). When the oven is hot, pour 2 tablespoons of oil onto 2 jelly roll pans and turn them in every direction so that the oil coats the pans. Heat the pans in the oven for 5 minutes. Place the onions and scallions in the bowl of a food processor and chop them into small pieces. Place them in a medium bowl. Shred the potatoes by hand on the large holes of a box grater or in a food processor with the shredding blade, and place in the bowl. Add the lemon juice, eggs, baking powder, potato starch, salt, and pepper and mix well. Very carefully (I mean really carefully; move very slowly) remove one of the pans and use your hands or a spoon to scoop up and drop clumps of the potato mixture, a little less than ¼ cup, onto the pan. I use my hands. Press the mixture down to flatten it a little. Place the pan in the oven for 10 to 12 minutes and immediately remove the second oiled pan. Repeat the same process with the remaining potato mixture and bake the second pan of latkes for 10 to 12 minutes. Bake them until the edges are well browned, and then with a slotted spatula turn them over and cook the latkes for another 8 to 10 minutes, or until the bottoms are browned. These can be made 2 days in advance and reheated in the oven. Meanwhile, to make the applesauce, heat the oil in a small saucepan over medium heat. Add the onions and cook them for 3 minutes, until they soften. Add the vinegar and brown sugar and cook for another 3 minutes. Add the apples, coriander, ginger, cinnamon stick, salt, and pepper, and cook, covered, on low heat for 15 minutes, or until the apples are soft. Let the mixture cool for 10 minutes and then purée it, using an immersion blender or a food processor. The applesauce can be made 4 days in advance and served warm or cold. The Matzah Project makes matzah you'll want snack on all year round.